Abuja, Nigeria. June 3, 2013 – Latest weekly poll results released by NOI Polls Limited has revealed that almost 8 in 10 Nigerians (78%) favour the continuity of the National Youth Service Corps (NYSC) scheme, and have expressed their views against its abolishment. Most Nigerians believe that, barring security challenges in some areas, the NYSC scheme provides youths the opportunity to gain work experience, engenders national unity, allows for cultural integration, aids economic development, and helps to boost the educational sector, especially in rural areas. However, there are mixed reactions regarding the general welfare of Youth Corpers. These are few of the key findings from the recent NYSC Poll conducted in the week of May 27th 2013. 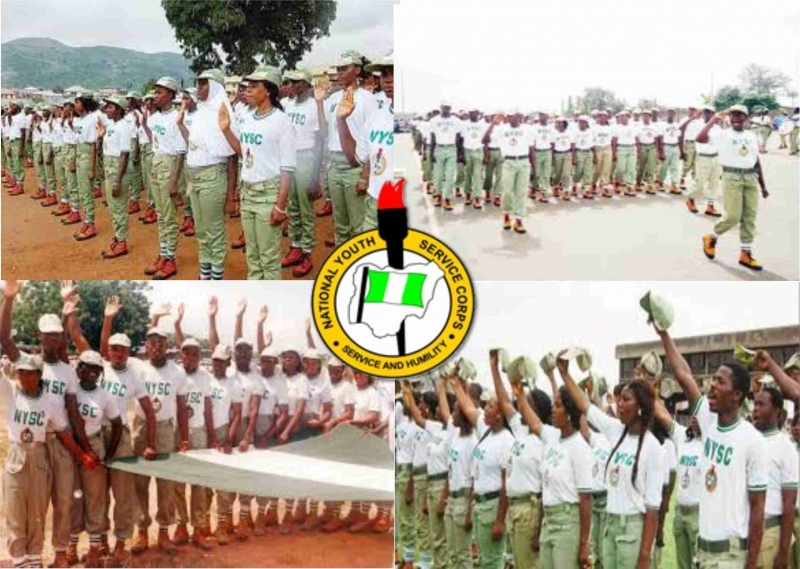 The National Youth Service Corps (NYSC) recently marked 40 years of its establishment. The scheme was created in May 1973 in a bid to reconstruct, reconcile and rebuild the country, after the Nigerian Civil War. Its vision was to mobilise Nigerian Youths with the spirit of selfless service in order to contribute their own quota of development in various communities of the country. Also, it was initiated to enhance unity of all Nigerians, notwithstanding social, cultural and religious differences. In recent times, the scheme has been faced several challenges, which have raised questions regarding the true contribution and continuity of the scheme. The general welfare of NYSC members has been one major issue that has raised concerns in the past years; with more recent insecurity experienced by corps members serving in certain volatile regions. These have generated mixed feelings and stirred up concerns by various stakeholders calling a review of the scheme, some groups calling for the outright abolition of the scheme. Speaking at the 2013 annual NYSC Management Conference that held in Sokoto state on May 15, 2013, the Minister of Youth Development Alhaji Inuwa Abdul-Kadir announced that the Nigerian government is committed to reforming the NYSC scheme to ensure that it contributes adequately to development in the country and national unity. His comments were necessitated by concerns voiced by Nigerians over insecurity in various parts of the country which has affected corpers in their states of primary assignment. In his speech the Minister advised that despite the challenges facing the scheme it has delivered on its mandates with visible results and has also integrated Nigerian youth from diverse backgrounds. Against this background, NOI Polls conducted its latest poll on the NYSC scheme in order to ascertain the views of Nigerians regarding the contribution of the scheme to nation development and provide some evidence to highlight their perceptions regarding continuity of the scheme. Respondents to the poll were asked five specific questions. The first question sought to determine the level of awareness about the NYSC scheme among Nigerians: Are you aware of the National Youth Service Corps (NYSC) Scheme? 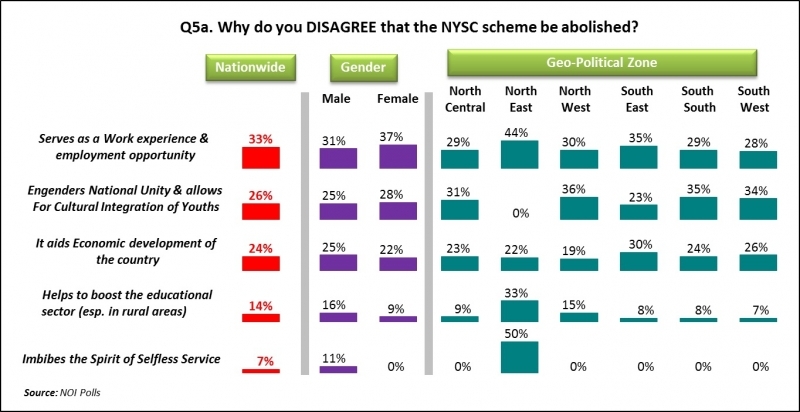 Overwhelmingly, all of the respondents (100%) from the six geo-political zones are aware of the NYSC scheme. This finding affirms the general level of awareness regarding the scheme across the country. The second question sought to ascertain the opinions of Nigerians regarding the impact the NYSC scheme has made on the country’s development. Respondents were asked: To what extent has the NYSC scheme impacted on the country's development? In response to this question, the overall majority (84%) suggested that the NYSC scheme has contributed positively to the country’s development; with 54% stating that it has impacted the country’s development “to some extent” and 30% stating that it has contributed “to a great extent”. However, while 9% of respondents were not sure of the impact of the scheme, a paltry 8% suggested that the scheme has not impacted on the country’s development in any way. In addition, when the results were analysed according to geo-political zones, the North-East zone accounts for the highest proportion of respondents that say the scheme has impacted the country to a great extent (46%). Comparatively, the South-West has the highest proportion of respondents (12%) who suggest that the scheme has not impacted Nigeria in any way. Subsequently, respondents were asked: How would you rate the general welfare of Youth Corpers? The responses provide mixed reactions from respondents regarding the welfare of Youth Corpers. On the one hand, majority of respondents 42% (35% + 7%) are of the opinion that the general welfare of Youth Corpers is “Good”. On the contrary, 34% (26% + 8%) suggest that the welfare of Youth Corpers is “Poor”. 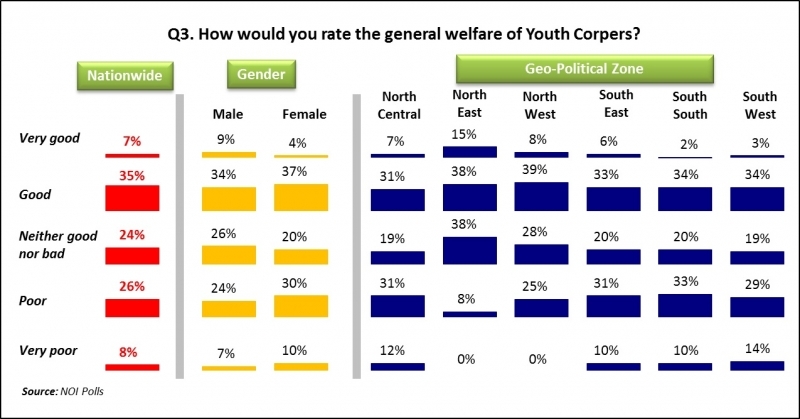 Looking across geo-political zones, the North-East zone accounts for the highest proportion of respondents (15%) that say the welfare of Youth Corpers is good (53% overall), while the South-West accounted for the highest proportion of respondents (14%) that say the welfare of Youth Corpers is very poor. Furthermore, respondents were asked the question: To what extent do you agree or disagree that the NYSC scheme be abolished? The results show that almost 8 in 10 Nigerians (78%: 54% + 24%) favour the continuity of the NYSC scheme; as 54% disagree and 24% strongly disagree that the scheme be abolished. On the other hand, 20% (10% + 10%) of the respondents agree scheme be abolished. Only 3% of the total sample remained neutral as to whether the scheme should be abolished or not. When the results are analyzed across geo-political zones, the North-East accounts for the highest proportion of respondents (69%) that are against the abolishment of the scheme. This finding lends credence to previous finding in question 2 above, where the North-East zone also accounts for the highest proportion of respondents (46%) that suggest the NYSC scheme has contributed to the nation’s development to a great extent. Finally, respondents were further probed on the reasons why they either agree or disagree that the NYSC scheme be abolished: Why do you agree/disagree that the NYSC Scheme be abolished? On one hand, amongst the majority of respondents that indicated support for the continuity of the NYSC scheme (78% of the total), 33% suggested that the scheme should not be abolished because it “Serves as a work experience & employment opportunity”. This was followed by 26% of respondents who were of the opinion that the scheme “Engenders national unity and allows for Cultural Integration” and 24% who suggested that “It aids Economic development of the country”. In addition, a further 14% suggested that the scheme “Helps to boost the educational sector (especially in rural areas)” and 7% who stated that it “Imbibes the spirit of selfless service”. These findings provide evidence to support the statement made recently by the Minister of Youth Development, Alhaji Inuwa Abdul-Kadir, that irrespective of the challenges facing the scheme, it has delivered on its mandates with visible results and has also provided the platform for cultural integration of Nigerian youths from diverse backgrounds. In summary, the results from this current poll results have revealed that almost 8 in 10 Nigerians (74%) disagree that the NYSC scheme be abolished due to its immense contribution towards the country’s development. Moreover the scheme provides youths the opportunity to gain work experience, engenders national unity, allows for cultural integration, aids economic development, and helps to boost the educational sector, especially in rural areas. However the results show that 20% of respondents support the abolition of the scheme due to insecurity in parts of the country, it’s considered a waste of resources and poor welfare of corps members amongst others. In conclusion, the poll has provided clear evidence to support the continued existence of the NYSC scheme. However, careful consideration ought to be given to the issues identified as reasons why some stakeholders are advocating for the abolition of the scheme. In particular, the management of NYSC should give careful consideration to issues bordering on security to avoid posting corps members to volatile regions and subsequent placements to hot spots. The general welfare of youth corpers should also be improved, with training focus on areas such as entrepreneurship and small business management as part of the service curriculum.